"My Momma Told Me, 'You'd Better Chaparral'"
The Los Angeles Times has linked an Interactive Google Map of the fires throughout the region, with updates on size, containment (of which there is still very little) and damage. 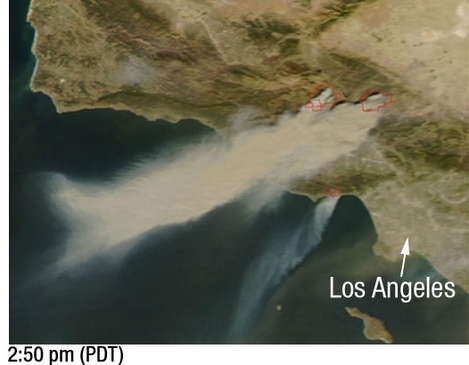 The NASA photo above gives an idea of the extent of fires around Los Angeles at mid-afternoon on Sunday. At the NASA website, you can compare that photo side by side with another from three hours earlier, for an inkling of how speedily the conflagrations spread once they got started. Maclean said the Forest Service could scale back structural protection without too much political fallout, but that would not be easy for the California Department of Forestry and Fire Protection, which answers to the governor. More than 6 million homes in the Golden State stand in wildfire 'red zones' and that number is expected to grow by 20 percent in the next decade. Large chaparral fires have occurred prior to 2003 and will continue to occur. Southern California has one of the worst fire-prone climates on earth. For example, an estimated total of 800,000 acres burned late September, 1889 in two different fires. One in Orange County, the other in San Diego County (the 2003 Cedar fire [in San Diego County] burned a little over 273,000 acres). They weren't big deals then because no one really lived in the back country. Now, with so many homes up against the wilderness, fires can become catastrophic. Los Angeles Times, September 27, 1889. The best ways to prevent loss of life and property are to retrofit existing structures to make them more fire safe, plan communities so they are not built in high fire risk areas, and maintain proper vegetation management directly around structures. Commissioner Poizner also reminds public adjusters of a law enacted after the 2003 wildfires that prohibits them from soliciting homeowners for adjusting business for seven calendar days after the disaster. The purpose of the law is to permit victims, such as victims of this week's fires, to have some time to comprehend their losses before contracts relating to their losses are solicited. * Matt Welch, then with Reason magazine and now of the Los Angeles Times, took a skeptical view of the FAIR plan in 2003, noting its tendency to encourage building in dangerous areas by making available unduly affordable insurance. A personal anecdote: When we bought our current home in Glendale, just north of Los Angeles, 16 years ago, a brushfire came within a quarter mile or less two days after we closed escrow. We were insured with the FAIR plan for the first ten years or so, at which point several private market insurers began writing in the neighborhood. Were those insurers unwise? Personally, I hope never to have cause to find out. The Malibu Schadenfreude identified by Steve Lopez and others today contains a legitimate public-policy issue within its (even more legitimate?) naked class envy/hatred. Namely, that many rich folk who build mansions in canyons -- and their less-rich compadres who build McMansions in foothills -- do so with subsidized, artificially inexpensive, actuarily unsound, government-secured insurance of last resort, called the California Fair Access to Insurance Requirements, or FAIR for short (and ironic). . . . It is peculiar that a government-based insurance mechanism originally intended to deal with the urban wreckage of the riotous -- but metaphorical -- "long hot summers" of the 1960's is now the central tentpole for property owners' responses to the literal "long hot summers" that annually turn southern California into the prime exhibit in the Tinder Box Museum. "Fires Turn Up Heat On a Key Advocate Of California Shrubs"